BULLS TOP 9,000 GNS. AND HEIFERS 5,700 GNS. 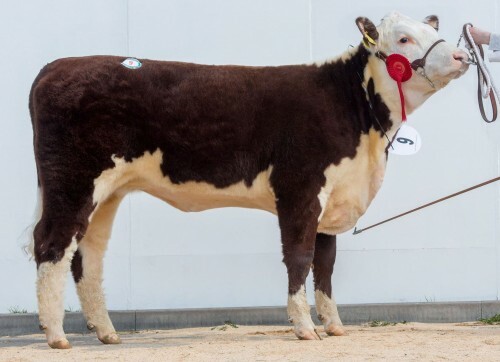 The Hereford Cattle Society Show & Sale on Tuesday exceeded all expectations, with a 100% clearance of the Show Heifers offered saw a top of 5,700 gns. paid for the Grand Female Champion, 14 month old Dendor 1 Molly 44th sired by the Danish bull, SMH Euro 30E bred & exhibited by D.E., E.D. & A.L. Jones, Newtown, Powys. “Molly” was purchased by local breeder, P.D. Vaughan, Kingsland, Herefordshire. Mr. Vaughan also purchased the Reserve Female Champion, 20 month old Romany 1 Ishbel H12 M4 sired by Romany 1 Heavyduty A84 H12 and bred by J.R.B. Wilson & Sons, Kelso, Roxburghshire for 5,300 gns. and two heifers bred by J. & W. McMordie, Ballygowan, Co. Down, Northern Ireland sired by Panmure 1 Henry – 19 month old Solpoll 1 Starlet M1 for 3,600 gns. and 18 month old Solpoll 1 Starlet M14 for 4,200 gns. Messrs. McMordie went on to sell three further heifers, 19 month old Solpoll 1 Starlet M8 by Solpoll 1 Dynamite for 5,500 gns. to J. Radcliffe, Swansea; 19 month old Solpoll 1 Starlet M6 by Danish sire Moeskaer Keno for 3,600 gns. to A.G. Whittle, Heywood, Lancashire and 19 month old Solpoll 1 Starlet M9 by Panmure Henry for 3,300 gns. to E. Pierce, Tiverton, Devon. Messrs. G. & M.C. Shepherd, Preston, Lancashire saw their 12 month old Moorside 1 Jane 6th by Canadian sire CCR 57 G Stamina sell for 3,800 gns. to Highridge Farm Partnership, Oxted, Surrey. An 80% clearance of the bulls offered saw the Grand Male Champion, 18 month old Fisher 1 McCoy (745 kgs) by Fisher 1 Jaguar, bred & exhibited by W.J. Hutchings & Sons, Chichester, Sussex top the sale at 9,000 gns. and sold to Highridge Farm Partnership, Oxted, Surrey. J. & W. McMordie, Ballygowan, Co. Down sold 19 month old Solpoll 1 Milkyway (780 kgs) by Panmure 1 Henry for 8,400 gns. to P. Murphy, Wychnor, Staffordshire and another “Henry” son, 25 month old Solpoll 1 Lawyer (975 kgs) for 8,000 gns. to Mr. & Mrs. J.R. Pike & Son, Chippenham, Wiltshire. A further two 19 month old bulls, Solpoll 1 Maverick (815 kgs) by Solpoll 1 Dynamite for 6,000 gns. purchased by Spendlove Bros., Kettering, Northants., and Solpoll 1 Mr. Daffy (795 kgs) by the Australian sire Wirruna Daffy D1 for 5,400 gns. to H. Richardson, Redditch, Worcestershire. Mrs. C.S. Fletcher, Appleby-in-Westmorland, Cumbria saw her 24 month old Barwise 1 Lekhwair (1,030 kgs) by Barwise 1 Wellington sell for 6,400 gns. to G.J. & E.M. Thomas, Ferwig, Cardiganshire. Mr. M. Ludgate, Thame, Oxfordshire sold the first bull through the ring, 30 month old Rempstone 1 245N Comply-or-Die (1,195 kgs) for 5,000 gns. to P. Cobley, Stoney Stanton, Leicestershire. Shadwell Estate Co. Ltd., Thetford, Norfolk, first-time exhibitors at the Society’s Sales sold two 19 month old bulls, Shadwell 1 Bomber M768 (920 kgs) by Solpoll 1 Dynamite for 4,600 gns. to T.G.R. Williams & Sons, Olney, Buckinghamshire and Shadwell 1 Beethoven M774 (1,050 kgs) by Aldersley 1 Edgar for 4,200 gns. to Mr. & Mrs. D.L. Wallace, Dulverton, Somerset. D.E., E.D. & A.L. Jones, Newtown, Powys, sold their 19 month old Dendor 1 Maverick (845 kgs) by Solpoll 1 Gilbert for 4,800 gns. to R. Hobbs, Truro, Cornwall. Messrs. Jones then went on to sell another son of “Gilbert”, the youngest bull in the Sale, 12 month old Dendor 1 Mufasa (575 kgs) for 4,500 gns. to B. & B. Rimmer, Preston, Lancashire.